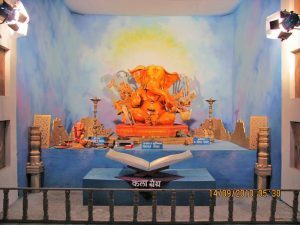 In Maharashtra, the Sarvajanik Ganeshotsav has been started by Lokamanya Bal Gangadhar Tilak during the pre-independence era. The main aim behind of it was to form unity among the people & create public awareness. He was of opinion that it will help the society to transform. With the same inspiration & desire, our seniors namely Mr. Ram Pednekar, Mr. Vijay ludbe, Mr.Murlidhar Chatpat & Mr. Sham Nichani had laid the foundation of the mandal in 1960 with the name ANKUR MITRA MANDAL. Since then, we are proud that we are taking active part in all social activities in the area. From such activities, We always tried our best to create humanity as well as peace and bind each other with healthy relations. ANKUR literal meaning of it is sprout. The sprout which sowed by our seniors has became a big tree now and also our young generation giving their maximum efforts to take mandal at top. As we have crosssed our GOLDEN JUBILEE YEAR, we pray our BAPPA that give us vigour to carry such good work for long. And make us capable enough to take society from darkness to brighter & healthier environment.